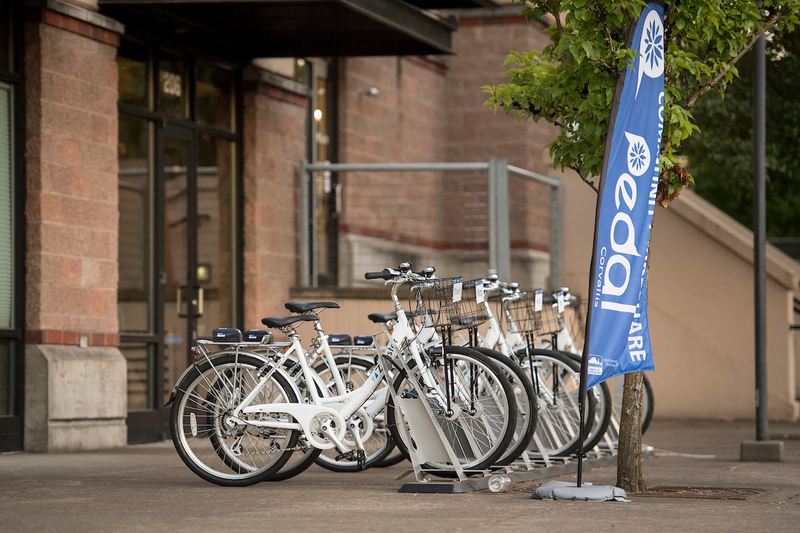 An exciting upgrade is now available for Pedal Corvallis bikeshare participants. The program’s mobile app now shows the real-time availability of bikes and bike-parking spaces at each station to make trip-planning more user-friendly. Bikesharing is a system of bikes available for short-term use. Pedal Corvallis is a community bikeshare program that includes eight stations, 41 bicycles, and two adult tricycles throughout Corvallis. More than 740 participants have taken more than 4,400 rides since the program launched last year. The fleet of white bikes are parked at designated racks throughout the City, and are available to anyone age 18 and older. An annual pass costs $25, a monthly pass $10, and a three-day pass $5. Pass holders can use their cell phones to unlock the bikes, and rides two hours and under are free at each pass level. The free mobile app can be downloaded from Google Play and the iTunes store. Bikes can also be accessed via text message. Visit www.OCWCOG.org/Pedal to learn more about the system. In addition to IHN-CCO, financial sponsors of Pedal Corvallis are Oregon State University, SamFit, Linn-Benton Community College, NuScale Power, the Corvallis Area Metropolitan Planning Organization, First Alternative Co-op, Woodstock’s Pizza, and the City of Corvallis Active Transportation Program. Community partners include the City of Corvallis, Benton County, Corvallis 509J School District, Samaritan Health Services, Oregon State Credit Union, and the Mid-Valley Bicycle Club. Maintenance and service is provided by Zagster, a bikeshare vendor with operations throughout the U.S.
To learn more about Pedal Corvallis, contact OCWCOG’s Community and Economic Development Department at 541-924-8480 or visit www.OCWCOG.org/Pedal.